Celebrate Mom with a one-of-a-kind bouquet, made to order with the most beautiful, fragrant flowers available. Delivered in a stylish glass vase, the bouquet is sure to make Mom smile all week long. Fresh blossoms of the season, lush greenery and more. NOTE: To ensure the best arrangement, pictured flower varieties and accents may vary. 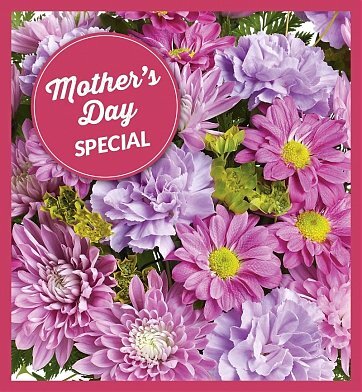 Mother's Day Special is a hand delivered gift. These gifts are delivered by one of our local design centers located throughout the United States and Canada. Same day delivery is available for most gifts when ordered before the cutoff time. The cutoff time for Mother's Day Special is in the recipient's time zone. Best Purchase for my mom! This purchase was a big hit for Mother's day. My mom said the flowers were beautiful! She appreciated the flowers coming arranged in a vase with water rather than a pile of flowers in a box, That was my mistake last year. I will be using your shop for all future purchases for my mom.